Mentha piperata, Carum Copticum, Cinnamomum Camphora, Gaultheria Fragrantissima, Syygium aromaticum, Cinnamomum zeylanicum, Myristica Fragrans, Capsicum annum, Eucalyptus globulus. It is a Magnificient Ointment for Headache, Body Pain, Nerves, Neck & Shoulder Pain, Gout, Sciatica, Synovitis, Arthritis, Pain of Muscles, Joints, Backache, Inflammation, Strains, Fibrositis, Dislocation, Slip Disc, Spondylitis, Cold, Sinus, Running Nose, Stomach Pain, etc. Apply ointment over the affected part and massage gently twice daily. 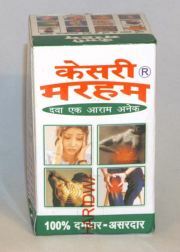 I used it.. and 100% pain relief products we recommended so many people and family members they also satisfied from it.. Explore more B.C. Hasaram & Sons products. I used it.. and 100% pain relief products we recommended so ..